Tim Easterwood, co-founder and co-CEO of BonusDrive LLC, has made a $1 million gift to Notre Dame Preparatory School and Marist Academy in Pontiac. The donation will support the costs of building the pre-K-12 school’s new science wing, which opened last August, and is enabling the school to expand its science, technology, engineering and math programs offerings. 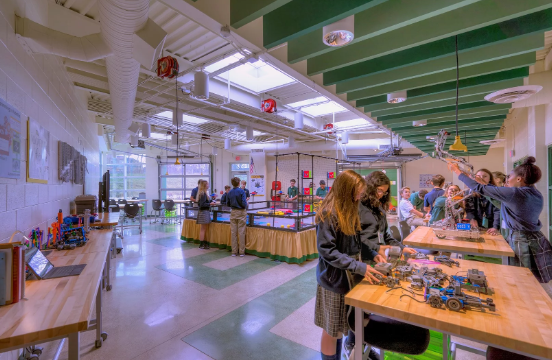 The wing includes new and renovated science laboratories, collaborative learning classrooms, a state-of-the-art lab for the school’s robotics program and two fine arts studios. In recognition of the gift, the private, independent Catholic school has renamed the new, 26,000-square-foot wing the Timothy J. Easterwood Science, Art and Technology Wing. His daughter attends the school.